Moon is Earth's only natural satellite and the only astronomical body other than Earth ever visited by human beings. The moon is the brightest object in the night sky but gives off no light of its own. Instead, it reflects light from the sun. Like Earth and the rest of the solar system, the moon is about 4.6 billion years old. The moon is much smaller than Earth. The moon's average radius (distance from its center to its surface) is 1,079.6 miles (1,737.4 kilometers), about 27 percent of the radius of Earth. The moon is also much less massive than Earth. The moon has a mass (amount of matter) of 8.10 x 1019 tons (7.35 x 1019 metric tons). Its mass in metric tons would be written out as 735 followed by 17 zeroes. Earth is about 81 times that massive. 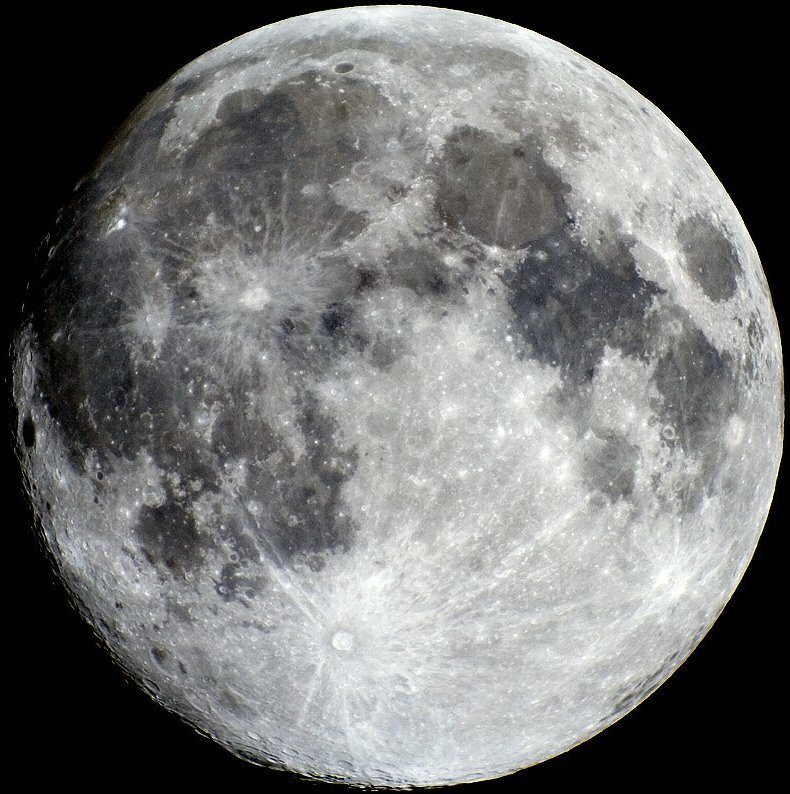 The moon's density (mass divided by volume) is about 3.34 grams per cubic centimeter, roughly 60 percent of Earth's density. Because the moon has less mass than Earth, the force due to gravity at the lunar surface is only about 1/6 of that on Earth. Thus, a person standing on the moon would feel as if his or her weight had decreased by 5/6. And if that person dropped a rock, the rock would fall to the surface much more slowly than the same rock would fall to Earth. Despite the moon's relatively weak gravitational force, the moon is close enough to Earth to produce tides in Earth's waters. The average distance from the center of Earth to the center of the moon is 238,897 miles (384,467 kilometers). That distance is growing -- but extremely slowly. The moon is moving away from Earth at a speed of about 1 1/2 inches (3.8 centimeters) per year. The temperature at the lunar equator ranges from extremely low to extremely high -- from about -280 degrees F (-173 degrees C) at night to +260 degrees F (+127 degrees C) in the daytime. In some deep craters near the moon's poles, the temperature is always near -400 degrees F (-240 degrees C). The moon has no life of any kind. Compared with Earth, it has changed little over billions of years. On the moon, the sky is black -- even during the day -- and the stars are always visible. A person on Earth looking at the moon with the unaided eye can see light and dark areas on the lunar surface. The light areas are rugged, cratered highlands known as terrae (TEHR ee). The word terrae is Latin for lands. The highlands are the original crust of the moon, shattered and fragmented by the impact of meteoroids, asteroids, and comets. Many craters in the terrae exceed 25 miles (40 kilometers) in diameter. The largest is the South Pole-Aitken Basin, which is 1,550 miles (2,500 kilometers) in diameter. The dark areas on the moon are known as maria (MAHR ee uh). The word maria is Latin for seas; its singular is mare (MAHR ee). The term comes from the smoothness of the dark areas and their resemblance to bodies of water. The maria are cratered landscapes that were partly flooded by lava when volcanoes erupted. The lava then froze, forming rock. Since that time, meteoroid impacts have created craters in the maria. The moon has no substantial atmosphere, but small amounts of certain gases are present above the lunar surface. People sometimes refer to those gases as the lunar atmosphere. This "atmosphere" can also be called an exosphere, defined as a tenuous (low-density) zone of particles surrounding an airless body. Mercury and some asteroids also have an exosphere. In 1959, scientists began to explore the moon with robot spacecraft. In that year, the Soviet Union sent a spacecraft called Luna 3 around the side of the moon that faces away from Earth. Luna 3 took the first photographs of that side of the moon. The word luna is Latin for moon. On July 20, 1969, the U.S. Apollo 11 lunar module landed on the moon in the first of six Apollo landings. Astronaut Neil A. Armstrong became the first human being to set foot on the moon. The moon moves in a variety of ways. For example, it rotates on its axis, an imaginary line that connects its poles. The moon also orbits Earth. Different amounts of the moon's lighted side become visible in phases because of the moon's orbit around Earth. During events called eclipses, the moon is positioned in line with Earth and the sun. A slight motion called libration enables us to see about 59 percent of the moon's surface at different times. The moon rotates on its axis once every 29 1/2 days. That is the period from one sunrise to the next, as seen from the lunar surface, and so it is known as a lunar day. By contrast, Earth takes only 24 hours for one rotation. The moon's axis of rotation, like that of Earth, is tilted. Astronomers measure axial tilt relative to a line perpendicular to the ecliptic plane, an imaginary surface through Earth's orbit around the sun. The tilt of Earth's axis is about 23.5 degrees from the perpendicular and accounts for the seasons on Earth. But the tilt of the moon's axis is only about 1.5 degrees, so the moon has no seasons. Another result of the smallness of the moon's tilt is that certain large peaks near the poles are always in sunlight. In addition, the floors of some craters -- particularly near the south pole -- are always in shadow. The moon completes one orbit of Earth with respect to the stars about every 27 1/3 days, a period known as a sidereal month. But the moon revolves around Earth once with respect to the sun in about 29 1/2 days, a period known as a synodic month. A sidereal month is slightly shorter than a synodic month because, as the moon revolves around Earth, Earth is revolving around the sun. The moon needs some extra time to "catch up" with Earth. If the moon started on its orbit from a spot between Earth and the sun, it would return to almost the same place in about 29 1/2 days. A synodic month equals a lunar day. As a result, the moon shows the same hemisphere -- the near side -- to Earth at all times. The other hemisphere -- the far side -- is always turned away from Earth. People sometimes mistakenly use the term dark side to refer to the far side. The moon does have a dark side -- it is the hemisphere that is turned away from the sun. The location of the dark side changes constantly, moving with the terminator, the dividing line between sunlight and dark. The lunar orbit, like the orbit of Earth, is shaped like a slightly flattened circle. The distance between the center of Earth and the moon's center varies throughout each orbit. At perigee (PEHR uh jee), when the moon is closest to Earth, that distance is 225,740 miles (363,300 kilometers). At apogee (AP uh jee), the farthest position, the distance is 251,970 miles (405,500 kilometers). The moon's orbit is elliptical (oval-shaped). References to left and right are for observers in the northern hemisphere of Earth only; in the southern hemisphere, these should be reversed. For example, a "waxing crescent moon" would have the left portion illuminated in the southern hemisphere. New Moon - The Moon's unilluminated side is facing the Earth. The Moon is not visible (except during a solar eclipse). As the moon orbits Earth, an observer on Earth can see the moon appear to change shape. It seems to change from a crescent to a circle and back again. The shape looks different from one day to the next because the observer sees different parts of the moon's sunlit surface as the moon orbits Earth. The different appearances are known as the phases of the moon. The moon goes through a complete cycle of phases in a synodic month. The moon has four phases: (1) new moon, (2) first quarter, (3) full moon, and (4) last quarter. When the moon is between the sun and Earth, its sunlit side is turned away from Earth. Astronomers call this darkened phase a new moon. The next night after a new moon, a thin crescent of light appears along the moon's eastern edge. The remaining portion of the moon that faces Earth is faintly visible because of earthshine, sunlight reflected from Earth to the moon. Each night, an observer on Earth can see more of the sunlit side as the terminator, the line between sunlight and dark, moves westward. After about seven days, the observer can see half a full moon, commonly called a half moon. This phase is known as the first quarter because it occurs one quarter of the way through the synodic month. About seven days later, the moon is on the side of Earth opposite the sun. The entire sunlit side of the moon is now visible. This phase is called a full moon. About seven days after a full moon, the observer again sees a half moon. This phase is the last quarter, or third quarter. After another seven days, the moon is between Earth and the sun, and another new moon occurs. As the moon changes from new moon to full moon, and more and more of it becomes visible, it is said to be waxing. As it changes from full moon to new moon, and less and less of it can be seen, it is waning. When the moon appears smaller than a half moon, it is called crescent. 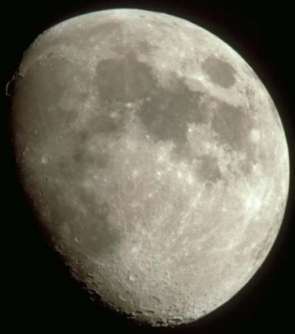 When it looks larger than a half moon, but is not yet a full moon, it is called gibbous (GIHB uhs). Like the sun, the moon rises in the east and sets in the west. As the moon progresses through its phases, it rises and sets at different times. In the new moon phase, it rises with the sun and travels close to the sun across the sky. Each successive day, the moon rises an average of about 50 minutes later. Eclipses occur when Earth, the sun, and the moon are in a straight line, or nearly so. A lunar eclipse occurs when Earth gets directly -- or almost directly -- between the sun and the moon, and Earth's shadow falls on the moon. A lunar eclipse can occur only during a full moon. A solar eclipse occurs when the moon gets directly -- or almost directly -- between the sun and Earth, and the moon's shadow falls on Earth. A solar eclipse can occur only during a new moon. During one part of each lunar orbit, Earth is between the sun and the moon; and, during another part of the orbit, the moon is between the sun and Earth. But in most cases, the astronomical bodies are not aligned directly enough to cause an eclipse. Instead, Earth casts its shadow into space above or below the moon, or the moon casts its shadow into space above or below Earth. The shadows extend into space in that way because the moon's orbit is tilted about 5 degrees relative to Earth's orbit around the sun. • Full Worm - March Moon As the temperature begins to warm and the ground begins to thaw, earthworm casts appear, heralding the return of the robins. The more northern tribes knew this Moon as the Full Crow Moon, when the cawing of crows signaled the end of winter; or the Full Crust Moon, because the snow cover becomes crusted from thawing by day and freezing at night. The Full Sap Moon, marking the time of tapping maple trees, is another variation. To the settlers, it was also known as the Lenten Moon, and was considered to be the last full Moon of winter. • Full Sturgeon Moon - August The fishing tribes are given credit for the naming of this Moon, since sturgeon, a large fish of the Great Lakes and other major bodies of water, were most readily caught during this month. A few tribes knew it as the Full Red Moon because, as the Moon rises, it appears reddish through any sultry haze. It was also called the Green Corn Moon or Grain Moon. • Full Harvest Moon - September This is the full Moon that occurs closest to the autumn equinox. In two years out of three, the Harvest Moon comes in September, but in some years it occurs in October. At the peak of harvest, farmers can work late into the night by the light of this Moon. Usually the full Moon rises an average of 50 minutes later each night, but for the few nights around the Harvest Moon, the Moon seems to rise at nearly the same time each night: just 25 to 30 minutes later across the U.S., and only 10 to 20 minutes later for much of Canada and Europe. Corn, pumpkins, squash, beans, and wild rice the chief Indian staples are now ready for gathering. 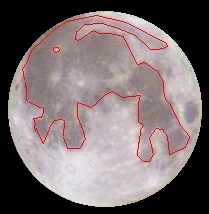 If you go out at night and look up at a full Moon, and you're like most people, you'll probably see the face of a man, or, alternatively, a rabbit superimposed on the bright disk of the Moon. The figure is composed of large dark areas (the lunar maria, or seas) on the Moon's surface. The figure's eyes are the Mare Imbrium and Mare Serenitatis, its nose is the Sinus Aestuum, and its open mouth is the Mare Nubium and Mare Cognitum. Because of it's rotation and orbit we have always seen the same side of the moon, the side with the face. The dark markings on the moon come from large basins on the surface that were created when other space objects (meteors and asteroids) crashed into the moon billions of years ago. The "eyes" of the face even have names; the right eye is the Imbrue basin, and the left eye is the Serenitatis basin. 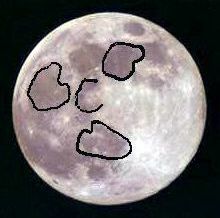 The rest of the features aren't quite as clearly "drawn", such as a nose and mouth, but most people would agree that the moon appears to be watching us. Scientists believe that the moon formed as a result of a collision known as the Giant Impact or the "Big Whack." According to this idea, Earth collided with a planet-sized object 4.6 billion years ago. As a result of the impact, a cloud of vaporized rock shot off Earth's surface and went into orbit around Earth. The cloud cooled and condensed into a ring of small, solid bodies, which then gathered together, forming the moon. The rapid joining together of the small bodies released much energy as heat. Consequently, the moon melted, creating an "ocean" of magma (melted rock). The magma ocean slowly cooled and solidified. As it cooled, dense, iron-rich materials sank deep into the moon. Those materials also cooled and solidified, forming the mantle, the layer of rock beneath the crust. As the crust formed, asteroids bombarded it heavily, shattering and churning it. The largest impacts may have stripped off the entire crust. Some collisions were so powerful that they almost split the moon into pieces. One such collision created the South Pole-Aitken Basin, one of the largest known impact craters in the solar system. About 4 billion to 3 billion years ago, melting occurred in the mantle, probably caused by radioactive elements deep in the moon's interior. The resulting magma erupted as dark, iron-rich lava, partly flooding the heavily cratered surface. The lava cooled and solidified into rocks known as basalts (buh SAWLTS). Small eruptions may have continued until as recently as 1 billion years ago. Since that time, only an occasional impact by an asteroid or comet has modified the surface. Because the moon has no atmosphere to burn up meteoroids, the bombardment continues to this day. However, it has become much less intense. Impacts of large objects can create craters. Impacts of micrometeoroids (tiny meteoroids) grind the surface rocks into a fine, dusty powder known as the regolith (REHG uh lihth). Regolith overlies all the bedrock on the moon. Because regolith forms as a result of exposure to space, the longer a rock is exposed, the thicker the regolith that forms on it. The lunar exosphere -- that is, the materials surrounding the moon that make up the lunar "atmosphere" -- consists mainly of gases that arrive as the solar wind. The solar wind is a continuous flow of gases from the sun -- mostly hydrogen and helium, along with some neon and argon. The remainder of the gases in the exosphere form on the moon. A continual "rain" of micrometeoroids heats lunar rocks, melting and vaporizing their surface. The most common atoms in the vapor are atoms of sodium and potassium. Those elements are present in tiny amounts -- only a few hundred atoms of each per cubic centimeter of exosphere. In addition to vapors produced by impacts, the moon also releases some gases from its interior. Most gases of the exosphere concentrate about halfway between the equator and the poles, and they are most plentiful just before sunrise. The solar wind continuously sweeps vapor into space, but the vapor is continuously replaced. During the night, the pressure of gases at the lunar surface is about 3.9 x 10-14 pound per square inch (2.7 x 10-10 pascal). That is a stronger vacuum than laboratories on Earth can usually achieve. The exosphere is so tenuous -- that is, so low in density -- that the rocket exhaust released during each Apollo landing temporarily doubled the total mass of the entire exosphere. The surface of the moon is covered with bowl-shaped holes called craters, shallow depressions called basins, and broad, flat plains known as maria. A powdery dust called the regolith overlies much of the surface of the moon. Basins are craters that are 190 miles (300 kilometers) or more across. The smaller basins have only a single inner ring of peaks, but the larger ones typically have multiple rings. The rings are concentric -- that is, they all have the same center, like the rings of a dartboard. The spectacular, multiple-ringed basin called the Eastern Sea (Mare Orientale) is almost 600 miles (1,000 kilometers) across. Other basins can be more than 1,200 miles (2,000 kilometers) in diameter -- as large as the entire western United States. Basins occur equally on the near side and far side. Most basins have little or no fill of basalt, particularly those on the far side. The difference in filling may be related to variations in the thickness of the crust. The far side has a thicker crust, so it is more difficult for molten rock to reach the surface there. In the highlands, the overlying ejecta blankets of the basins make up most of the upper few miles or kilometers of material. Much of this material is a large, thick layer of shattered and crushed rock known as breccia (BREHCH ee uh). Scientists can learn about the original crust by studying tiny fragments of breccia. Maria, the dark areas on the surface of the moon, make up about 16 percent of the surface area. Some maria are named in Latin for weather terms -- for example, Mare Imbrium (Sea of Rains) and Mare Nubium (Sea of Clouds). Others are named for states of mind, as in Mare Serenitatus (Sea of Serenity) and Mare Tranquillitatis (Sea of Tranquility). Landforms on the maria tend to be smaller than those of the highlands. The small size of mare features relates to the scale of the processes that formed them -- volcanic eruptions and crustal deformation, rather than large impacts. The chief landforms on the maria include wrinkle ridges and rilles and other volcanic features. Wrinkle ridges are blisterlike humps that wind across the surface of almost all maria. The ridges are actually broad folds in the rocks, created by compression. Many wrinkle ridges are roughly circular, aligned with small peaks that stick up through the maria and outlining interior rings. Circular ridge systems also outline buried features, such as rims of craters that existed before the maria formed. Rilles are snakelike depressions that wind across many areas of the maria. Scientists formerly thought the rilles might be ancient riverbeds. However, they now suspect that the rilles are channels formed by running lava. One piece of evidence favoring this view is the dryness of rock samples brought to Earth by Apollo astronauts; the samples have almost no water in their molecular structure. In addition, detailed photographs show that the rilles are shaped somewhat like channels created by flowing lava on Earth. Scattered throughout the maria are a variety of other features formed by volcanic eruptions. Within Mare Imbrium, scarps (lines of cliffs) wind their way across the surface. The scarps are lava flow fronts, places where lava solidified, enabling lava that was still molten to pile up behind them. The presence of the scarps is one piece of evidence indicating that the maria consist of solidified basaltic lava. Small hills and domes with pits on top are probably little volcanoes. Both dome-shaped and cone-shaped volcanoes cluster together in many places, as on Earth. One of the largest concentrations of cones on the moon is the Marius Hills complex in Oceanus Procellarum (Ocean of Storms). Within this complex are numerous wrinkle ridges and rilles, and more than 50 volcanoes. Large areas of maria and terrae are covered by dark material known as dark mantle deposits. Evidence collected by the Apollo missions confirmed that dark mantling is volcanic ash. Much smaller dark mantles are associated with small craters that lie on the fractured floors of large craters. Those mantles may be cinder cones -- low, broad, cone-shaped hills formed by explosive volcanic eruptions. The moon, like Earth, has three interior zones -- crust, mantle, and core. However, the composition, structure, and origin of the zones on the moon are much different from those on Earth. Most of what scientists know about the interior of Earth and the moon has been learned by studying seismic events -- earthquakes and moonquakes, respectively. The data on moonquakes come from scientific equipment set up by Apollo astronauts from 1969 to 1972. The average thickness of the lunar crust is about 43 miles (70 kilometers), compared with about 6 miles (10 kilometers) for Earth's crust. The outermost part of the moon's crust is broken, fractured, and jumbled as a result of the large impacts it has endured. This shattered zone gives way to intact material below a depth of about 6 miles. The bottom of the crust is defined by an abrupt increase in rock density at a depth of about 37 miles (60 kilometers) on the near side and about 50 miles (80 kilometers) on the far side. The mantle of the moon consists of dense rocks that are rich in iron and magnesium. The mantle formed during the period of global melting. Low-density minerals floated to the outer layers of the moon, while dense minerals sank deeper into it. Later, the mantle partly melted due to a build-up of heat in the deep interior. The source of the heat was probably the decay (breakup) of uranium and other radioactive elements. This melting produced basaltic magmas -- bodies of molten rock. The magmas later made their way to the surface and erupted as the mare lavas and ashes. Although mare volcanism occurred for more than 1 billion years -- from at least 4 billion years to fewer than 3 billion years ago -- much less than 1 percent of the volume of the mantle ever remelted. Data gathered by Lunar Prospector confirmed that the moon has a core and enabled scientists to estimate its size. The core has a radius of only about 250 miles (400 kilometers). By contrast, the radius of Earth's core is about 2,200 miles (3,500 kilometers). 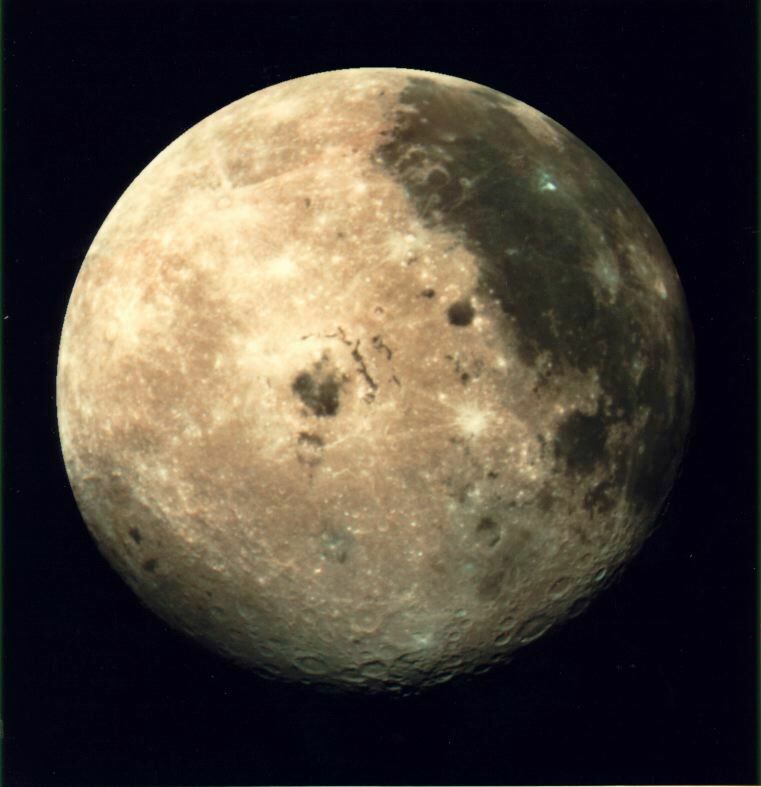 The lunar core has less than 1 percent of the mass of the moon. Scientists suspect that the core consists mostly of iron, and it may also contain large amounts of sulfur and other elements. Earth's core is made mostly of molten iron and nickel. This rapidly rotating molten core is responsible for Earth's magnetic field. A magnetic field is an influence that a magnetic object creates in the region around it. If the core of a planet or a satellite is molten, motion within the core caused by the rotation of the planet or satellite makes the core magnetic. But the small, partly molten core of the moon cannot generate a global magnetic field. However, small regions on the lunar surface are magnetic. Scientists are not sure how these regions acquired magnetism. Perhaps the moon once had a larger, more molten core. There is evidence that the lunar interior formerly contained gas, and that some gas may still be there. Basalt from the moon contains holes called vesicles that are created during a volcanic eruption. On Earth, gas that is dissolved in magma comes out of solution during an eruption, much as carbon dioxide comes out of a carbonated beverage when you shake the drink container. The presence of vesicles in lunar basalt indicates that the deep interior contained gases, probably carbon monoxide or gaseous sulfur. The existence of volcanic ash is further evidence of interior gas; on Earth, volcanic eruptions are largely driven by gas. By Comparison: Oscillates roughly 0.15 degrees in 173 days. The radius of the moon is 1,738 kilometer (1,080 miles), the diameter is 3476 kilometers (2,160 miles). Total weight: of the moon is 74 sextillion kilograms (81 Quintillion Tons). Gravity at the surface of the moon is 1/6 that of the Earth. The Orbital speed of the moon is 3680 km per hour (2,287 mph). It takes 60 to 70 hrs flying time to get to the moon by rocket. The age of the oldest rock collected is 4.5 Billion years old. The rocks collected by Apollo weigh 382 kg (842 pounds). The moon's widest craters are 225 km (140 miles) in diameter. On July 20, 1969, Neil Armstrong became the first human being to set foot on the Moon. The surface area of the moon is 37,932,000 square km (14,658,000 square miles) or 9.4 billion acres. The moon is not round, but egg shaped with the large end pointed towards earth. The earth rotates about 1000 mph. By comparison, the moon rotates about 10 mph. The moon has no atmosphere or clouds. Its surface is scarred from hundreds and thousands of meteors that have struck it over billions of years. Moon soil is called regolith. "Moonquakes" are millions of times less powerful than earthquakes. There are two high tides and two low tides every day on every beach on Earth, because of the moon's pull. Only 12 people have every walked on the surface of the moon. People have not gone to the moon since 1972. From 1972 to present only four spacecraft orbited the moon, Clementine, Hiten, Lunar Prospector and Smart-1. 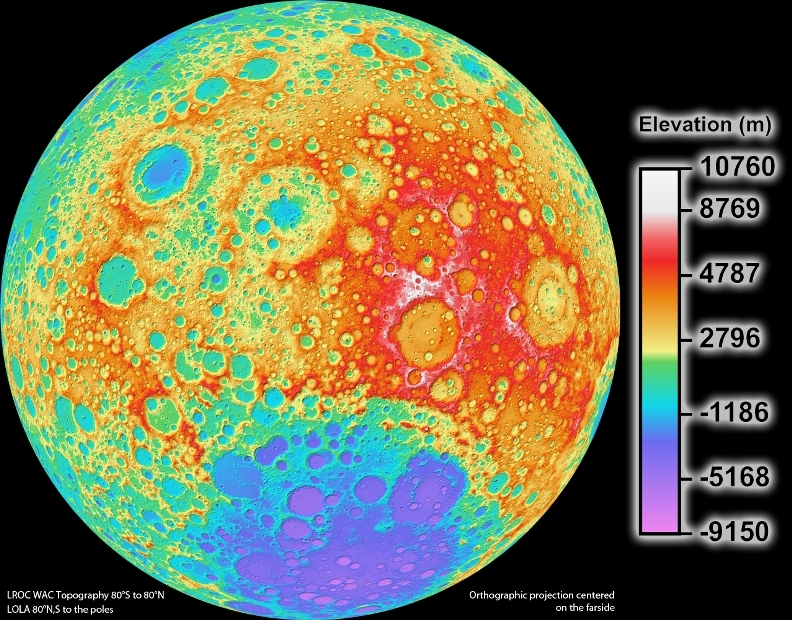 The Clementine spacecraft discovered evidence of ice at the Moon's south pole. Some people believe that moonlight causes insanity. "Don't stare at the moon. You'll go crazy." The word "lunatic" comes from when doctors thought that the insane were "moonstruck." The ancient Chinese greeted solar eclipses by using noisemakers and by shooting arrows toward the heavens. The Moon's orbit is inclined 5 degrees from the Earth's ecliptic. The face of the Moon is marked by regions, called mare, Latin for "sea". A name given by Galileo who thought the dark featureless areas were bodies of water. We now know them to be basalt (a type of lava) filled impact basins. The sidereal monthis the average period of revolution of the moon around the earth in reference to a fixed star, equal to 27 days, 7 hours, 43 minutes in units of mean solar time.